About three years ago, I spent some time generating Lissajous figures1 with a couple of AD98502 DDS synthesizers. Today (October 2018) the AD9850 boards on eBay go for about £10, but you can buy a similar product based around the AD98333 for about £2.50 or £5 with buffers and fancy connectors. The AD9850 handles higher-frequencies (up to 60MHz) whilst the AD8933 is limited to 12.5MHz. That’s fine for me though: I’m interested in frequencies below 100kHz. To be pedantic the AD9833 can handle frequencies up to half the frequency of the reference clock, but all the eBay boards use a 25MHz oscillator. I was interested in using these to build a swept-frequency generator i.e. to create a signal which is basically sinusoidal with slowly increasing frequency. Incidentally you can also get similar boards based around the Silicon Labs Si53514 chip. These generate multiple clocks and cost about £10. 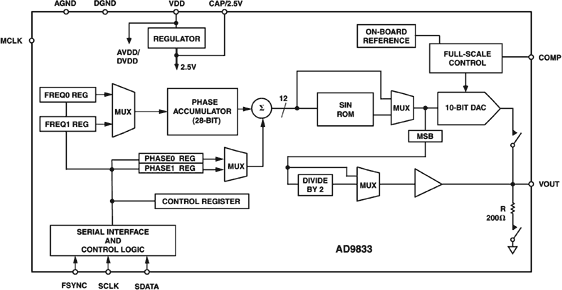 The AD9833 lets you store two different frequencies and then switch between them easily. This makes it easier to implement frequency-shift keying5. The phase of the output can also be tweaked. This makes it easier to implement phase-shift keying6. However, we can ignore these if we just want to generate a slowly changing sine wave. Google will furnish many articles on ad9833 arduino7, but it’s not quite clear of their relative merits. Most of the libraries implement a C++ class which hides the functionality of the chip behind a nice API. Sadly the one I tried seemed to reset the phase accumulator when the frequency changed, leading to discontinuities in the output. Given the datasheet, It is simple to program the chip to generate a single frequency, so I thought it better to just drive it directly. There is one wrinkle though: although the interface to the AD9833 is essentially SPI, blog posts commonly talk about it finding it hard to use the system SPI and instead use bespoke bit-banging code. I followed that advice here, and stole the SPI code from Marco Colli’s library8. The code above is entirely self-contained, so it is easy to port it to the Raspberry Pi. I switched the code from C to Python, targetting the gpiozero9 API. You can get the code from GitHub10. Revised by Martin Oldfield on 25 Oct 2018, original version 25 Oct 2018.